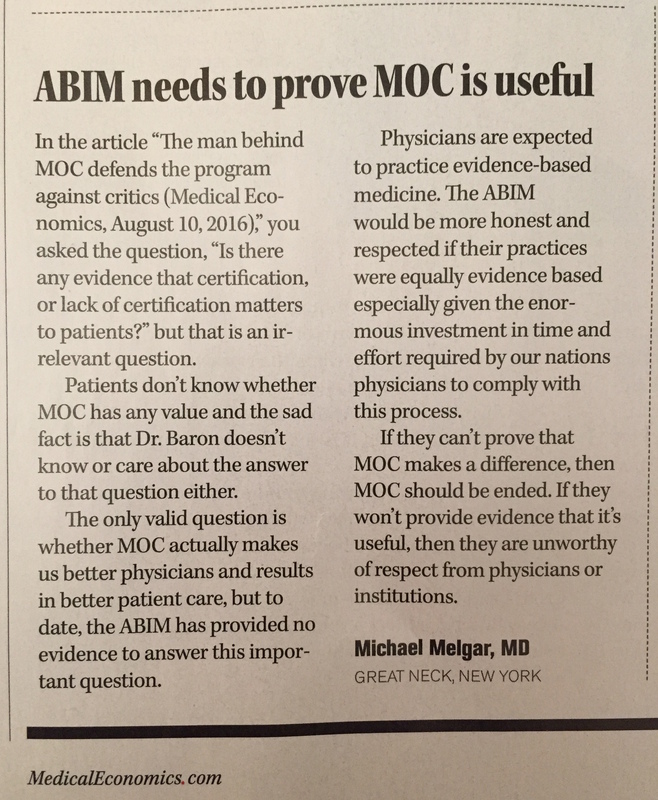 ABIM *has* proven that MOC is useful in the only way that matters to ABIM...to their revenue stream. To any other issues that matter to practicing physicians, ABIM offers only hyperbole or #OstrichStrategy. I'm a 65-yr-old white guy; severe emphysema; smoked 1-2 packs/day, 40+ years. Unless they've come up with a cure I haven't heard about, I'm not getting any better, ever. For they hospital (Wake Forest Baptist Medical Center) to send me a survey is absurd. I have told their "CEO" (an M.D.) that. Plus I told him to get out of the way between me and my physician. There isn't anything that he or his minions of M.B.A.'s can contribute to my care. Maybe there ought to be MOC's for CEO's. Anti-MOC legislation in every state should be a goal. One should settle for nothing less. Secondarily there should be a thorough investigation of the ABIM/ABMS by the DOJ, Inspector General and IRS. The stock markets are showing complete confidence in our democratic republic and the transition of power. The ABIM/ABMS and its associates have been protected from investigation by the current justice department and the corporate owned media. We must be very clear eyed about the ABIM/ABMS. It is no different than a bad investment. A dog in the portfolio. It has just been downgraded to a strong sell. ABIM and its umbrella has cheated its clients and it is time for the ABIM/ABMS to pay the clients back. The ABIM/ABMS is a politically active non-governmental-organization enjoying tax-exempt status. It is involved in racketeering and has created a monopoly complete with its own secret surveillance/police run by a convicted felon. This is a scandal that cannot be overlooked forever by the media. Our justice system and IRS investigators/attorneys must be informed of what corruption is allowed to exist right under their noses. A class action lawsuit will be a very good place to get the DoJ and IRS's attention. I give a vote of no confidence in the ABIM/ABMS. It is imperative that an investigation ensues with indictments for all that these self-enriching political profligates have engaged in. ***ABIM's Christine Cassel and her executives restructured the Human Resources and COO offices in 2008 to consolidate power and create greater control over the ABIM and physicians. Court records and other documents confirm there is a political and economic timeline. Altering/omissions of CV's by two key HR leaders and Benjamin Mannes (COO's office as Director of Investigations) hired in 2008 raises alarm bells. The ABIM's timeline starting in 1989 reveals the power of laundered ABIMF/MOC money and the creation of a secret police by the Clinton/Obama administration's crony Christine Cassel. The use of the term "WAR CHEST" referring to secretive money transferred from ABIM to ABIMF from 1989 to 2007 is completely justified in our opinion. The activities we know of are dubious and should warrant a thorough investigation of the ABIM's role in politics and its connections to the Clinton/Obama/Biden administration. 10-year/continuous MOC scam. What some physicians may not yet realize. It is all about the money. Its all about politics. It is not about quality assurance. There is absolutely no proof that MOC makes better docs. End it and make docs whole again. Initial certification is completely satisfactory. But the ABMS is so out of touch and mob-like that the certification should be acquired elsewhere. The ABMS is becoming like an Eliot Ness comic strip/cartoon. MOC is not even legitimate CME, because the ABIM executives are so out of touch with the practice of medicine there are indications that they don't even know what year it is; or who is president of the United States of America when you ask them. They just give you a blank stare in disbelief. You hold up two fingers in front of these dazed ABIM execs for a reality check and they think it means scissors. You ask, "How many?" And they dribble out associative words about scissors. All they can muster is paranoia about someone cutting useless regulatory and bureaucratic strangulations in government. They think they are the government when you ask them what they do for a living. How delusional and out of touch can your get? We have a government of, for and by the people. Certainly the ABMS and ABIM can get that point. But they don't because they have wander too far into the deep end. But in all seriousness there is direct evidence that certification and mandatory MOC busywork are just front activities for the ABIM's real activities. It is a bogus money making scheme to pad the already rich pockets of executives in order to support the political ambitions of ABIM/ABMS partisan cronies. They have not had a non-progressive involved at the ABIM since 1935. Physicians should clean up the organization and install some fiscal conservatives. Progressives with socio-political scorecards have used the organizations to win political favors and earn money at 400% times the market rate compared to what a hard working physician earns. The ABIM should be all-volunteer again with no salary or compensation for the test questions or board members. Dump the executive positions. And dump the gestapo. Less is more just as the CMS and Choosing Wisely professes to us. "social justice", phony foundations, false claims, intimidation, hired thugs, elitism, disgust for the common person, collusion, and "pay to play". Now that the Clintons are out of power, the cronyism, false claims, and fascism of the ABMS/ABIM should easily crumble with the continued pressure from the common physician.